Lakes MTB (mountain biking), started as just an Instagram account who searched for and reposted images from the Lake District. This became a huge success in a very short space of time, which led Andy to think about the next steps and how could he really put the Lake District on the map for national and international mountain bikers. Andy is not only a mountain biker, but also a graphic designer, who owns/runs a graphic design studio based in Kendal called Cactus Creative. The problem that Andy had, was that whenever he posted a photo with a stunning view and some bikes, everyone would start asking him where it was, so to fix this he came up with the idea of creating a website to act as a landing page for people to find routes to ride in the Lake District. Andy knew a lot of talented photographers and video makers, so he decided to combine everything into one. 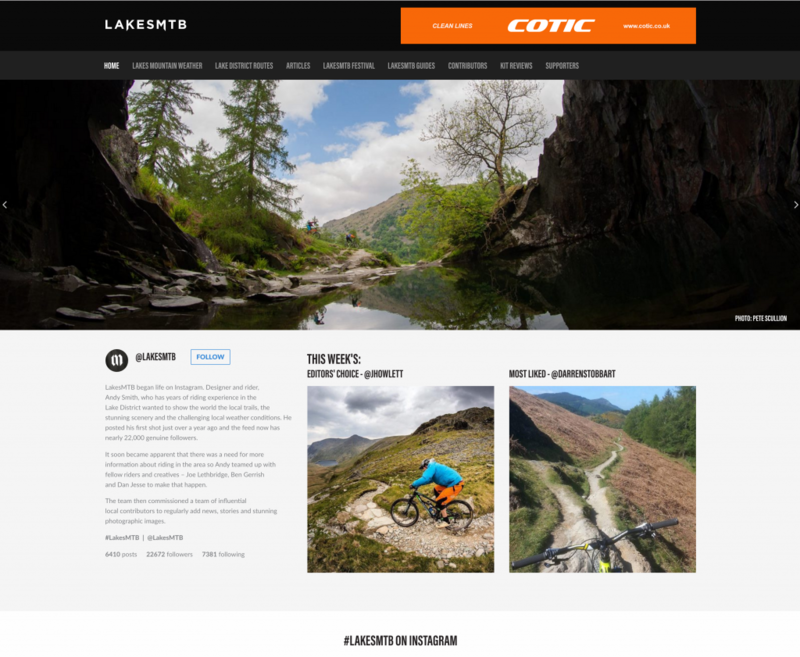 For the Lakes MTB site, we worked remotely with Andy and the Cactus Creative team to get the design of the website right. I’m not sure if you’ve ever worked with graphic designers before but they have a fantastic eye for even the smallest of detail. The kind of detail that most wouldn’t notice, but when everything comes together it makes the whole design look more polished. We built the site on WordPress, and use the Instagram API to integrate the stats and latest images into the website. We gave their team full access to go in and add their own content and make their own changes, this is one of the most positive things about WordPress, just how easy it is to use. The website acts as a great platform for Andy and the team to get stuck into affiliate marketing which will allow them to create a small revenue stream to cover their costs.